FIFA in crisis: power, corruption and lies. FIFA has endured other crises in its 107 years and survived them all with a comparative modicum of media fuss. First came the refusal of the English Football Association to take a lead, which nearly killed the FIFA concept at birth. After the First World War a bitter disagreement about matches against enemy nations nearly prompted a breakaway. Then the British associations quit in a row over amateurism. FIFA very nearly went bankrupt after the Second World War. And later came the African walkout in the 1960s, and the Iron Curtain fury over Chile a decade later. In 2002, FIFA again teetered on the brink of financial and political self-destruction after the collapse of marketing agent ISL and the cancellation of World Cup insurance provoked by the events of 7/11. But nothing can be compared to the recent events which have been scarred and marred not so much by “open” issues but by the far more insidious issues of corruption allegations. They centred on the presidents of CONCACAF and Asia, Jack Warner and presidential challenger Mohamed Bin Hammam, but the collateral damage washed over just about everyone else. Above all, president Sepp Blatter took the bulk of the blame because he has been titular and executive head of the world football federation for 13 years. Thus, to all intents and purposes, he had committed the sin of complacency, born of a remarkable financial expansion, of football’s growing worldwide popularity and of anachieved World Cup in South Africa. Also, of course, a trigger of discontent had remained loosely set after the vote-rigging scandal and the flood of anger and controversy which had accompanied the awards last December of the 2018 and 2022 World Cups to Russia and Qatar. The fallout rumbles on. On the very morning of the 61st FIFA Congress in Zurich, the German media was reporting the latest urgings from DFB president Theo Zwanziger that a serious investigation was needed into the 2022 award. The image of the Qatar bid had been damaged by association after Bin Hammam – himself a Qatari – was suspended provisionally, along with Warner, by the ethics committee just three days before Congress over allegations of collusion at an attempt to bribe delegates at a Caribbean Football Union meeting. FIFA’s notice had been drawn to the subsequent allegations by Chuck Blazer, the general secretary of CONCACAF. His long-time partnership with Warner within both the confederation and the FIFA ExCo made his action all the more sensational…and of a totally different complexion to the long-delayed tales of bid intrigue revealed by Lord Triesman under the protection of parliamentary privilege. Accusation and counter-accusation flew around Zurich in the days leading up to Congress, days which included a tetchy press conference with Blatter and a lecture to FIFA to put its house in order from Micheline Calmy-Rey, president of the Swiss Confederation, at the opening ceremony of Congress. If there is one item the FIFA family’s faithful resent above all else it is being lectured on their own supposed failings by outsiders. Hence Spanish federation president Angel Maria Villar indulged himself during Congress in a diatribe rubbishing analysis of FIFA businessby both the media “who attack our freedom because it costs them nothing” and politicians “who think they know everything… but have no idea”. Blatter, if his words are to be believed, may have got the message. In the build-up to the vote, he has worked hard to distance himself from his ExCo colleagues, saying “I am elected by Congress, they are chosen only by their own confederations”, and, after escaping unscathed from a Bin Hammam-provoked brush with the ethics committee, that he had accepted “we are in difficulties”. Not that he was happy to concede as much to the media. “Crisis? What is a crisis?” he had pleaded with faux-innocence at one of the most uncomfortable of press conferences. For once neither his self-confident bonhomie nor his gravitas alternative worked its usual spell. Thus he came before Congress, sweeping to an unopposed 186-vote victory (17 abstentions) admitting that the FIFA ship was in troubled waters but he believed he had solutions to “bring it safely into harbour once more”. setting up a “solutions committee” from within the football family to recommend whatever changes in governance were needed. The concepts were approved by 176-4 (with 26 abstentions), but the detail will need to be put intoeffect by an extraordinary congress, probably in October or November. Blatter also promised radical reforms, partly to assuage public and political opinion to stop “all this ugly criticism, these allegations, insinuations, left, right and centre, because our credibility and the reputation of us all, is at stake”. He added: “I, personally, am willing to face the public anger in order to serve football. I am the captain weathering the storm. This is a difficult period of FIFA, I admit it readily, not only is the pyramid shaking but our ship has drawn some water and is in difficult waters, even troubled waters. “This is the reason why we must put this ship back on course and for this we need a leader, someone who will accept this responsibility. I am willing to do this and reforms will be made – not just touch-ups but radical decisions, the necessary reforms. He painted himself as “the captain weathering the storm…in difficult waters, even troubled waters” but considered himself as the man prepared “to put this ship back on course”. Blatter drew a conclusion that the problems facing FIFA stemmed directly from its success and the success of the World Cup. This had been laid bare by the controversies surrounding the attributions last December of the finals in 2018 and 2022. He said: “This kicked off a wave of criticisms which are still coming. They are concentrated on the World Cup because it has not just the economic value but the social and political value of the World Cup and it is our duty to react. “The first fact: is it correct that the attribution is done by the executive committee? In one of the [congress] interventions it was said we should give more power to the associations. I am 100 per cent in agreement. I want the organisation of the World Cup decided by FIFA Congress. But this, said Blatter, was not enough. He continued: “There is in the air public opinion and politics, and remember the message yesterday from the president of the Swiss confederation. We must have an instrument to inquire deeply into all the accusations against FIFA. 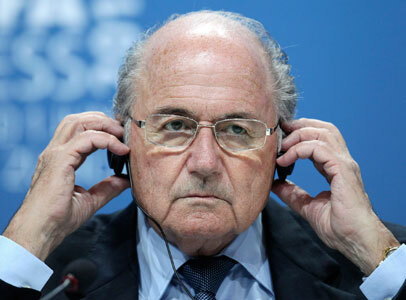 Blatter has said loud and clear that this will be his last term of office. If anything offers a glimmer of hope it is that. Blatter will not want his legacy to be the memory of the man who led FIFA to the brink of the precipice.